Enerwhere, a DEWA certified solar PV contractor based in Dubai, has completed the installation of 300 kWp solar rooftop plant on the roof of Prominent Printing & Publishing Co. L.L.C. in Dubai Investment Park (DIP). 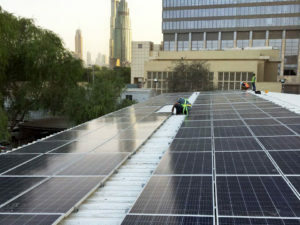 This project has been grid connected under the Shams Dubai initiative, DEWA’s first smart initiative to connect solar energy to buildings. Prominent Printing & Publishing Co. L.L.C. an ISO certified company operates in DIP where they have multiple machines in various categories to perform prepress, binding, packaging, press and logistics. They have invested in this 300 kWp solar rooftop plant in order to meet their financial and sustainability targets. Zain Kazani, Sales Director, Prominent Printing & Publishing Co. L.L.C. The 300 kWp solar rooftop plant, which will generate approximately 480 MWh electricity and reduce 256 tons of CO2 emissions annually, was fully designed, engineered and constructed by Enerwhere. Prominent Printing & Publishing Co. L.L.C. is in the phase of expanding their manufacturing capacity and are planning to double the solar plant size in 2018 with Enerwhere. Enerwhere is the world’s first distributed solar utility company, based in Dubai. Enerwhere uniquely combines a range of technologies to provide the cheapest, cleanest, and most efficient energy solution to meet the power needs of customers in construction, oil & gas, mining, hospitality and manufacturing sectors. Because all of Enerwhere’s equipment is fully modular and transportable these solutions are available on a rental / lease basis, saving customers money from day one. In order to fund its triple digit annual growth, Enerwhere is currently raising funds via the Eureeca crowd funding platform. Enerwhere will use the funds to precure additional solar and battery equipment, and to fund working capital. For more information and to register interest in the crowd funding please visit: http://info.eureeca.com/enerwhere . For further information about Enerwhere, please visit www.enerwhere.com.